BeachesFour beaches are contained within the limits of the park: Manuel Antonio, Espadilla Sur, Teldoro, and Playita. With their large light sand berms, it is easy to see why they attract beach goers of all ages. The first is separated from the second by a "tombolo", or natural land bridge formed by sand accumulations. Visitors may enjoy a roughly hour-long hike from Espadilla to the top of Punta Catedral (100 m). 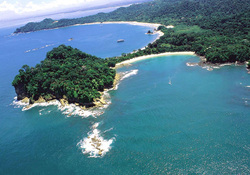 Both Manuel Antonio and Espadilla Sur contain tidal pools and offer the possibility of snorkeling. BiodiversityAlthough Manuel Antonio National Park is Costa Rica's smallest national park, the diversity of wildlife in its 6.83 km2 (3 sq mi) is unequaled with 109 species of mammals and 184 species of birds. Both Brown-throated Three-toed Sloth and Hoffmann's Two-toed Sloth (perezosos) are a major feature, as are three of Costa Rica's four monkey species — the Mantled Howler monkey, Central American Squirrel Monkey, and White-headed Capuchinmonkey. Black Spiny-tailed Iguana, Green Iguana, Common Basilisk, White-nosed Coati and many snake and batspecies are also common in the park. Included in the 184 bird species are toucans, woodpeckers, potoos,motmots, tanagers, Turkey Vulture, parakeets and hawks. Dolphins can be observed there, as well as the occasional migrating whale. Scuba diving, snorkeling, sea kayaking, mountain biking, and hiking provide opportunities to experience the tropical wildlife that enriches Manuel Antonio. Manuel Antonio is Costa Rica's second most visited park behind the Poás Volcano National Park which lies very close to San José, the country's largest urban area. The park's popularity has led to development of the surrounding areas, with environmental impacts to nearby forests and beaches.